With professor Dilip Soman at the University of Toronto, we developed the “Purpose App”, a mobile app that motivates people to achieve their goals through “nudge.” We were presented with the challenge of translating and applying the conceptual principles of behavioral economics, identifying relevant data sets, and building a back-end system for two apps to collect the user interaction data that researchers were interested in analyzing. 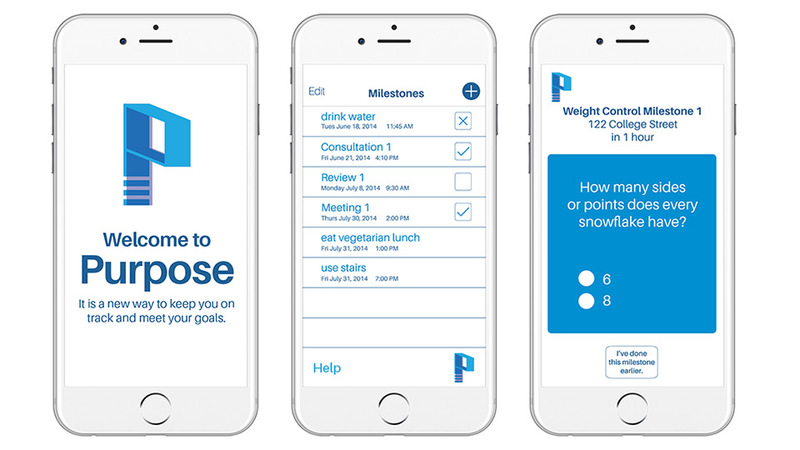 The “Purpose App” was intriguing and unique because we had the opportunity to design a product for behavior change. After interviewing researchers to clarify their data collection needs, we co-worked with our clients to create a project document for each app to specify the technical requirements and the data sets needed. Along with back-end development, our clients needed to make the app usable for their subjects, so we designed a user-friendly and clean interface that minimized visual noise. Two versions of “Purpose” apps were developed to compare data sets from a control and intervention group under research ethics. Users were able to set their tasks under personal goals (e.g. weight control, study, fitness etc), received reminder notifications, as well as report task completion. Once the task was done, users received another notification to report if the task was complete or not. The two apps, intervention and control, had mostly the same functionality, except the intervention app sent off “smart” notifications that were designed to trigger users’ implementation mindset. The smart notifications come with firstly with trivia questions, then implementation questions (e.g. asking how to get to the gym instead of whether it’s worth going to the gym). If a user missed a task, tips for achieving personal goals were delivered as stronger nudges to take actions. MultiMension produced not only the mobile apps but also all online training materials (FAQ site, demo videos, technical documents). Researchers were able to collect significant, insightful data from the apps. They found that between the intervention and control groups there was a delay between planned-task ending time and the actual time when the task was reported as complete. Among intervention app users, people who interacted with the choice question also reported task completion sooner. Users generally reported that smart notifications motivated them to not immediately dismiss task reminders. In particular, the enjoyed interacting with trivia questions. The “Purpose App” research and findings were presented at an academic conference in Chicago. We’re proud to report that the app source code has been shared internationally for organizations and developers who want to incorporate behavioral economics into their product development.